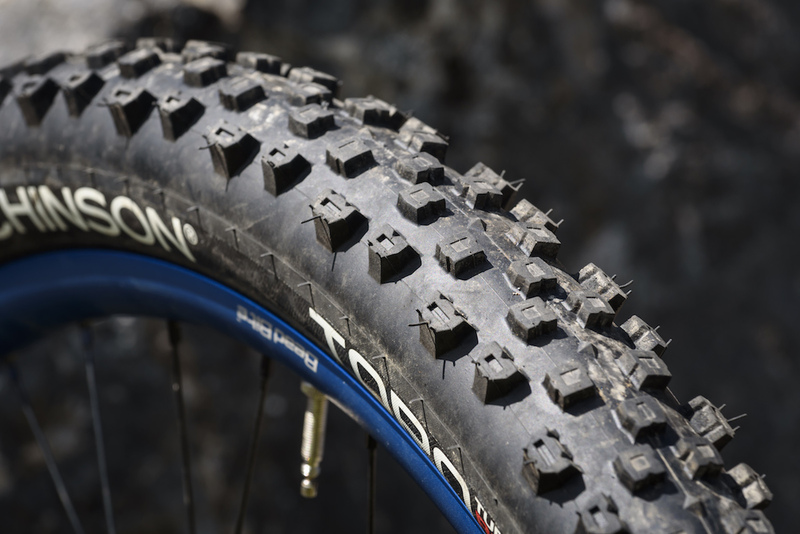 To keep testing consistent, we tested all tyres in a 27.5in size, and in a width between 2.3-2.4in. 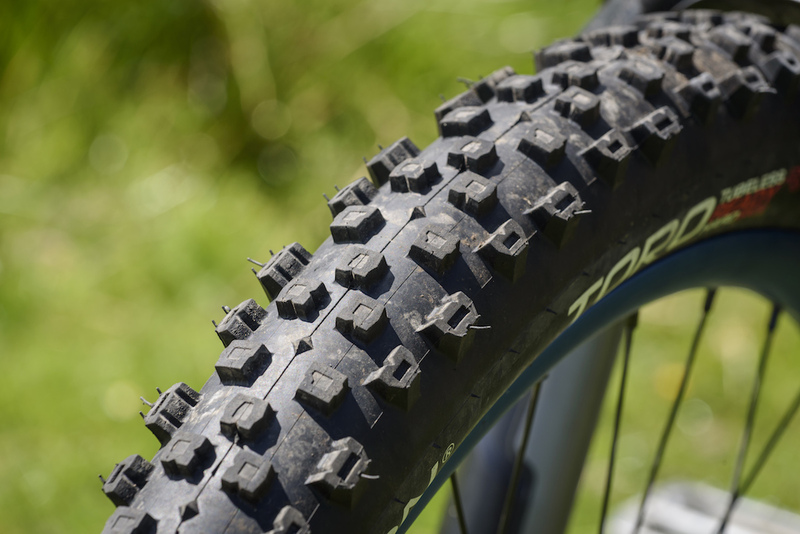 As part of that group test, we rated all ten tyres according to several key performance characteristics including wet weather traction, dry condition grip, predictability, speed, long term wear, durability, and ease of setup. And because some tyres are best suited for use on the front or on the rear, we gave our evaluation for each tyre to let you know where each one performs best. At the end of the test period, we then presented four separate awards; Best Winter Tyre, Best Summer Tyre, Most Durable Tyre, and Best All Rounder Tyre. The heavy-duty Toro turned out to be the toughest tyre in the whole group test. 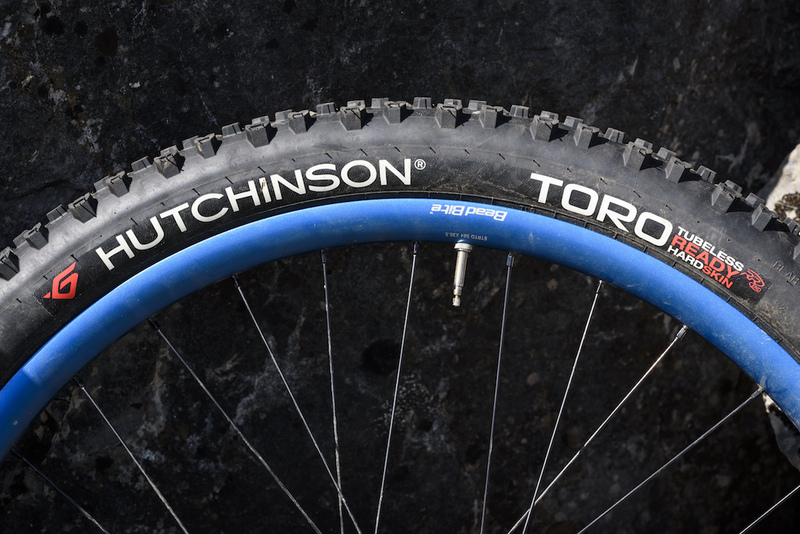 Featuring a dual ply 66tpi casing, huge volume, and massive, widely spaced, square-edged knobs, the Hutchinson Toros look like the sort of tyre a child would come up with if asked to draw a mountain bike. An absolute monster of a tyre, these are the heaviest on test at 1,150g (1,080g claimed). By comparison, the lightest tyres here (Vee Crown Gem) are a featherweight 750g, and putting the two side by side, it’s obvious where that extra weight has gone. 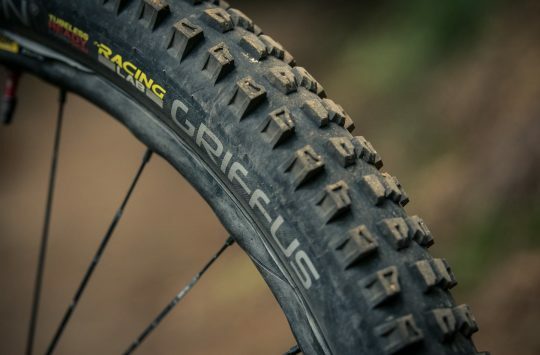 The Toros went up very easily tubeless on both Spank OOZY 345 and Mavic XA Pro Carbon wheels without needing a compressor and the nice beefy sidewalls didn’t leak a drop of sealant throughout the test. 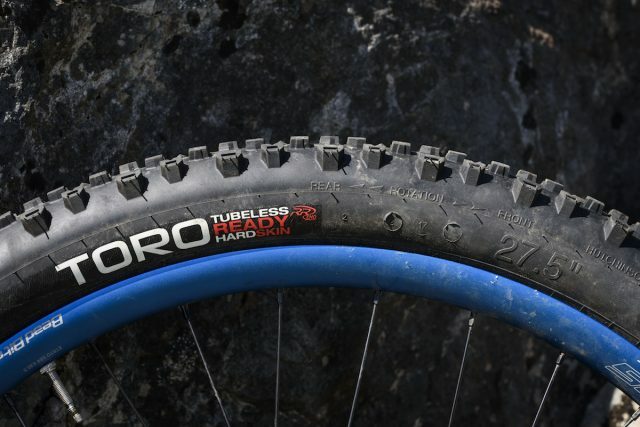 One thing that pleasantly surprised us was just how much rubber there was directly under the tread – reinforced sidewalls can take a lot of the limelight when it comes to preventing pinches and flats on tubeless tyres, leaving the area under the tread feeling a bit anaemic by comparison, but this wasn’t the case on the Toros. The open blocky tread pattern looks simple, but each knob has been carefully sculpted and siped to maximise traction. The stepped shoulder blocks shed mud well, and hold through the turns with impressive tenacity. While the tyres are marked as directional we couldn’t spot a great deal of difference in the tread pattern, but to be on the safe side we ran them as specified. A much more rounded profile tyre compared to a High Roller II, they definitely reward better technique – there is much less braking control once leant over on the side knobs, but get all your slowing down done on the centre knobs and you’ll be laughing. Initially we were a bit unsure about the staggered edge knobs and whether they would give consistent cornering, but we needn’t have worried and they were particularly brilliant on soft, loamy trails, changing direction quickly when darting between trees. On wet, greasy rock, the Toros struggled a little, where a softer compound tyre such as a Magic Mary Super Soft would have been welcome, but then the Toros are faster rolling than those so it’s swings and roundabouts. The Hardskin casing puts extra meat through the sidewalls, and underneath the tread too. They climbed well in all conditions, with an excellent tread for use on the rear in all conditions – they really dig in and you can rely on it not to slip out at inopportune moments, although as the heaviest tyres on test they were a bit draggy on longer fire road climbs, and if your riding doesn’t warrant such a burly tyre it might be worth looking at lighter options. We really liked the higher volume for their quoted size, which meant we could get away with lower pressures to increase grip, and with a surprisingly thick casing directly under the tread they stood up exceptionally well to everything we could throw at them. On one of the fastest and rockiest trails in the Lakes with 24/28 psi front and rear, and fingers nowhere near the brakes, I could clearly hear the rims impacting on the rocks, but the tyre stayed intact. 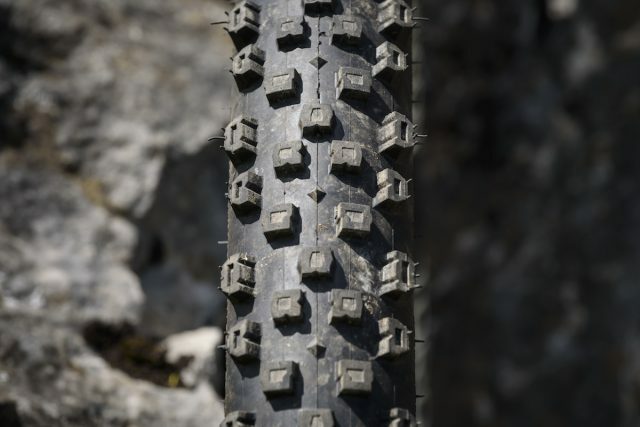 The casing has certainly taken some hits, including the Enduro National Championships, and in spite of some scarring on the sidewalls we have no complaints about the durability of these tyres. The only tyre to escape unscathed despite James’ best attempts. 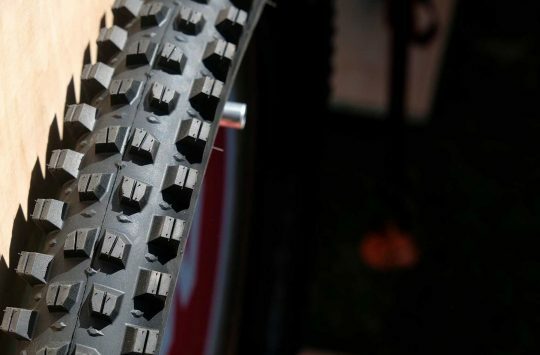 These tyres won’t suit everyone because of their rounded tread profile, and there’s no getting away from the fact that they weigh a heck of a lot, but if you’re fed up of destroying tyres and just want to get on with riding, these could be ideal. The higher volume and extra thick rubber under the tread, means that we were unable to damage the tyres (and believe me we tried), and the balance of wear vs grip was great too. 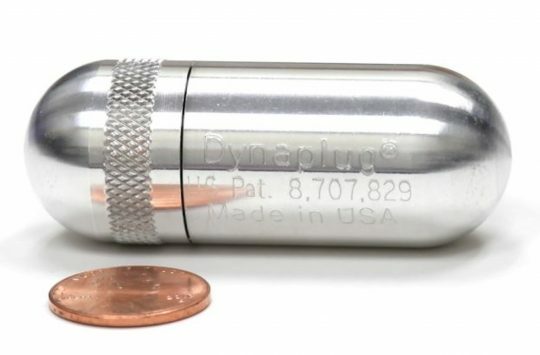 I have one of these for the front. Agree that they are excellent in soft and loose conditions although I also find they track very well on wet roots and rocks.